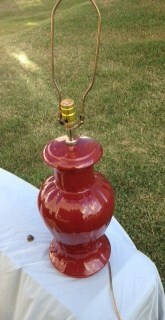 This is my ugly lamp before. This is my ugly lamp after. I have to admit I’m kind of impressed with myself. 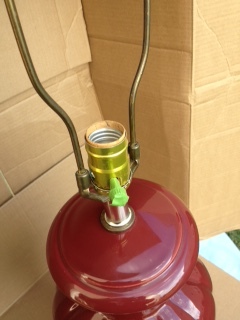 For a spray painting, lamp DIY-ing virgin, I think I made Martha kinda proud. The only thing I do need to do (a project for the future!) is obtain a new lampshade. Or make one. Or DIY one. Who knows? All I know is that I feel like I deserve a trophy for best DIY by a DIY virgin. 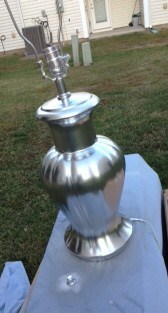 Wait – doesn’t the lamp sorta look like a trophy? Sweeeeeet! Now, I know you are asking how I achieved this amazing feat of DIY awesomeness and I’m going to show you. Again, I did a bit of reading online – several different sources give different methods. 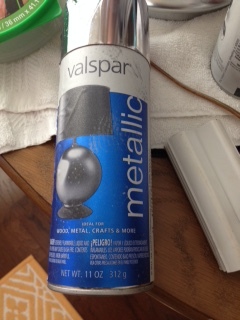 I was looking for something metallic, so that left the spray paint route. Clean the lamp. WELL. And then clean it again. Make sure it’s totally dry before you start. 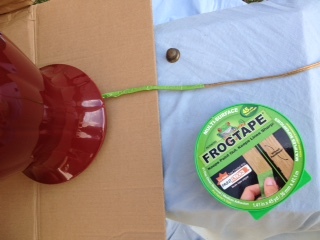 You want to frog tape everything you don’t want to be silver (or whatever color you are painting the lamp). I taped off the cord and the light switch. I live in a townhouse, so all of my projects must be completed in the great outdoors, far enough away that I won’t get wind-blown paint on anyone’s house. Thankfully, I have an end unit and I set up this cardboard box trick I learned in my scrapbooking days when using spray glue. In the future, I’d like to have something plywood, but for now, this lovely Amazon box (below) will have to do. I used two old stools with a found board across (I scavenge lumber from construction sites). and that’s my work table. Then I used an old sheet as a drop cloth. 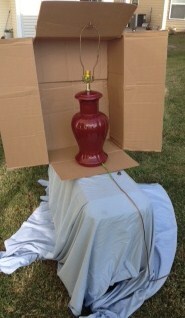 The lamp was heavy enough to hold the box up. Repeat after me: Primer is my friend! 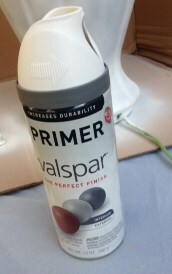 The better you prime, the easier and smoother the paint sticks. Thankfully I primed this enough I only needed one coat of the spray paint with a few light sprays to touch it up and that was it. I wound up putting on about 3 coats – light coats and the directions were easy. Had to let it dry about 5 minutes in between coats. Then when done, it has to sit at least an hour before you can paint it. Cost: about $4.00. Used about 1/2 the can, so $2.00! 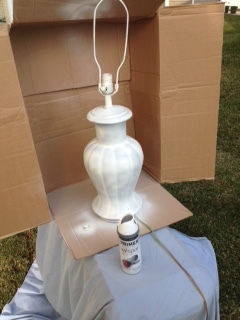 I thought the lamp looked great just with the primer! Like I said, anything was a massive improvement! stated 1 hour to handle (it just didn’t look dry enough to me). After 2 hours it was fine to touch. I brought it in and let it sit overnight on a drop cloth. That was it! Couldn’t believe how easy it was. Cost of paint: $6.00 and I have at least 3/4 or more left in the can, so I’ll estimate $1.50 for that. Painting: 15 minutes, had to sit at least an hour after. 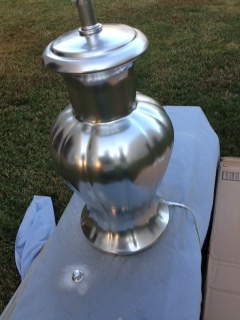 Bam… I have lost my spray paint virginity, and now I’m looking at what else I can paint… Hmm… to be continued!